This Luncheon Society gathering took place in 2013 with a very smart young man who –no doubt-will go very far. A Millennial examines how his generation is profoundly impacting politics, business, media, and activism. They’ve been called, entitled, narcissistic, “the worst employees in history”, “trophy kids”, and even “the dumbest generation.” But, argues David D. Burstein, the Millennial Generation’s unique blend of civic idealism and savvy pragmatism, combined with their seamless ability to navigate the 21st century world – where constant and fast change is the new normal – will enable them to overcome the short-term challenges of a deeply divided nation and begin to address our world’s long-term challenges. With eighty million Millennials (people who are today eighteen to thirty years old) coming of age and emerging as leaders in America alone, this is the largest generation in U.S. history, by 2020, its members will represent one out of every three adults in the country. They are more ethnically and racially diverse than their elders, they are the first generation to come of age in a truly global world, and the first to come of age in the new digital era. Millennials have begun their careers amidst a recession which has seen record youth unemployment levels, yet they remain optimistic about their future. 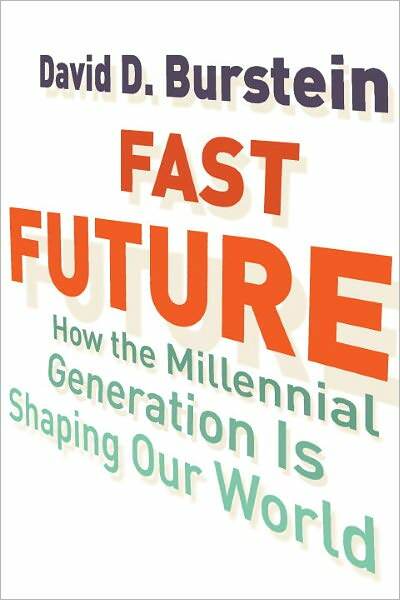 Drawing on extensive interviews with his Millennial peers and compelling new research, Burstein illustrates how his generation is simultaneously shaping and being shaped by a fast-paced and fast-changing world. Part oral history, part social documentary, FAST FUTURE reveals the impact and story of the Millennial Generation – in their own words. What distinguishes the Millennial Generation in profile and character and potential from other generations? Millennials are more global, more tolerant, more diverse, more educated, more connected, and bigger than any generation before them. They embrace change. They are the only generation to come of age with one foot in the old world of pre-internet, pre-Facebook, pre-computer, doing their first research projects in libraries, and another foot in the digital era. They understand the best of the old world and the best of the new and are happily blending them together. They are defined by their willingness to try new things, to adapt, and to bootstrap—something they’ve had to learn in the wake of the recession. This nimble ability to adapt and move in our current fast future positions Millennials uniquely among generations. Every generation sees its innovations as the most pioneering, its role in the political process as the most essential, its promise as the greatest? In what ways do you argue this is true about Millennials? Every generation does feel that way and Millennials are no exception. But for the first time Millennials actually can lay claim to filling that in their lifetime. The ability for a person under 30 to act on the thought that they want to disrupt an industry or change the way the world works has never been greater. Today a young person can start a business or an organization without any meaningful resources. What’s more, we see our peers doing these things so it’s no longer seen as a strange pursuit. We live in the age of the possible where for the first time there are more things we can do than things we cannot. This is something Millennials are keenly aware of and we see them acting on it every day, whether that means banding together to elect Barack Obama in 2008 or creating the first platform in the world to connect a billion people. But yet, when you look at early Millennial supporters of Obama or the early days of Facebook, they didn’t begin by saying “I have this huge dream of connecting a billion people” or “We can change the course of history.” No, they both began by breaking off a piece of those bigger goals and digging in to make that first piece happen, then the next, and so on. What do you see your generation’s greatest contribution to the political process as being? For several decades American politicians have partaken in divisive culture wars over issues like gay marriage. For most Millennials, whether or not gay people should be allowed to marry is not a big moral question. To us, it seems obvious that the answer should be yes. Now, politicians on a wide spectrum ranging from President Obama to conservative North Carolina Senator Richard Burr have cited young people’s changing views on the issue as the leading factor that pushed them to endorse gay marriage and vote for the repeal of Don’t Ask Don’t Tell. Millennials are helping push older politicians to get out of the “culture war” business, it’s happening on gay marriage and it’s beginning to happen on other issues like abortion and immigration as well. I’d of course be remiss if I didn’t mention the essential role that young people played in the 2008 election as a key reason Barack Obama was elected. However, the greatest contribution yet to come is how we govern and act as politicians, something we’ll know more about in the next several election cycles as more Millennials run for office. You call the Millennial Generation “the most global generation.” What do you mean by￼ this? There has never been a generation which has had so much in common with its global peers. Technology has inherently globalized our experiences. Everything from music and pop culture to ideas and beliefs has become globalized, and Millennials are really the initial participants in that global culture. If you look at an average 65-year-old in America and an average 65-year-old in China you will find a significant culture barrier. Compare an average 22-year-old in China and America and that gap shrinks. Because technology has made us all so interconnected we can instantly be aware of the same events taking place around the world and in each other’s countries. In the 1960s, young activists who called themselves communists and claimed to be working in solidarity with their young communist peers, actually had no idea what those people really wanted and were really like. Today, around the globe, Millennials are aware of the climate crisis, we know it affects all of us, so we’ve seen a global surge in youth environmentalism. It also helps that it’s easier than ever to be in touch with people in any country, with one click on Facebook or Skype. In a global world, more of us are encountering people from other countries in our daily lives. “Another country” seems closer than ever. In fact 71% of Millennials believe they will spend some significant portion of their life living overseas. What does “fast future” imply? The fast future is the world we are all currently living in. In 1968, “2001: A Space Odyssey” imagined what the world might be like in the then far off year of 2001. Today we can’t even conceive of what the world might look like in forty years, let alone know what to do with that information. We can no longer envision the future, even if just for fun. The future is coming at us faster and faster, the rate of change is increasing and the amount of change that takes place in a given year is skyrocketing as well. So much change has taken place so fast that our governments, businesses, and other large institutions haven’t always had enough time to fully catch up. But, this is the reality the Millennials have come of age in and this is the environment they are the masters of, they can operate in this fast-changing fast future world. Knowing the rules, having the tools, and being of this new mode, Millennials are better suited than anyone to effect change in the fast future. You describe your generation as being both pragmatic and idealistic? Don’t those describe states at opposite ends of the spectrum? For a long time pragmatism and idealism have been perceived as opposites. Throughout much of the 1950s, in post–World War II America, the pendulum swung very far in the direction of pragmatism: society was led by a deep focus on careers, families, automobiles, homes, and a general mentality of personal success, “getting ahead,” and sharing in the abundant and growing economic pie. This was an approach to life leavened by comparatively little idealism about the possibilities for progress in the outside world. Just a decade later, by the late 1960s, many young people were advocating total revolution and frontal assault on capitalism and every manifestation of “the system” and its values. Extreme action, some believed, was the best way to change society. The pendulum had now swung very far toward idealism, with pragmatic concerns frequently thrown overboard into a sea of angry marchers and demonstrators who believed that only hyperbolic rhetoric and action in the streets could bring about change. In the fast future world, neither of these approaches is the path towards tackling big problems. Millennials have developed a hybrid model: Pragmatic idealism. Practicing pragmatic idealism means that while Millennials want to bring about broad-based idealistic social change, we understand that we need a plan in order to do so. That plan inevitably involves working inside and outside all of our institutions from business to politics. Often it means doing both at the same time. You offer some powerful examples of the activist Millennial? How is activism and engagement intrinsic in your generation, or is it? Being members of the most global and most connected generation in history means we’re deeply aware of our world and all its problems. As a Millennial today, you really have to make an active effort not to engage with the world. Causes and issues surround us in the messages we receive every day. We are so aware of our global problems and we see how deep they are, that to not help in some way seems illogical. Activism really looks different today than it did fifty or even twenty years ago. Tom Friedman and others have criticized Millennials for not “being out in the streets.” And others have concluded that because they can’t see Millennials out in the streets we’re not activists. Activism is done online, through working private meetings with influencers, and even through starting businesses. It’s more practical and more effective. Likewise, you name many agents of change in the world of business and social entrepreneurship. What is it about the Millennial Generation’s profile that makes you leaders in business and social venture that differs from the previous generation? Millennials have seen the way that government has failed and the ways that traditional not for profits have failed. We’re excited by the ways that social business can do well and do good at the same time. We see this as a promising middle ground that can motivate the forces in society to do better at solving problems. We’ve been leaders and pioneers of the social entrepreneurship sector, which barely existed in 2008 and now counts tens of thousands among its ranks. Today there are almost half a dozen new models for companies that bake social good into a corporate charter from B Corps to L3Cs, these options excite and are being utilized by Millennials. As with other fields, Millennials have a belief that the old models aren’t working and in a fast changing world, we can help new models come to life. Some critics say that the youth demographic is congenitally excited, easily engaged and mobilized, but that you fizzle out. Is there any truth in that? How would you combat that assessment? It’s hard to find an example of an effort that Millennials have engaged in which then fizzled out. Unlike the boomer generation, our commitment to social change is not rooted in a specific event or piece of legislation (i.e. the Civil Rights Act or the War in Vietnam), our commitment is to issues: environmental justice, greater economic opportunity, more equal education, long term fiscal sanity, and a more stable and peaceful world. The Boomers have been criticized for “selling out” as they left the activist ranks to enter mainstream professions. For many it was because the clear objectives of their causes were achieved. The Millennial agenda is much broader, so it’s not far-fetched to expect many Millennials to be working on these issues for the rest of their lives. What generation most closely resembles the Millennials? The Millennials really are a unique generation. However, our penchant for social action brings to mind aspects of the Boomer Generation’s worldview. But while Boomers often favored radical activism, we see change as more evolutionary than revolutionary. We want big idealistic change, but we believe that in order to make that change we have to work with, within, and outside of our society’s big institutions. This is a mindset I refer to as pragmatic idealism which is found throughout the Millennial Generation. There are also parallels between Millennials and members of the greatest generation, both in terms of the major way the economic climate shaped both generations and also in terms of our strong civic-mindedness, in the case of the Greatest Generation, that arose in large part as a result of growing up during World War II, for Millennials, much of that civic-mindedness arose from 9/11 and its aftermath. 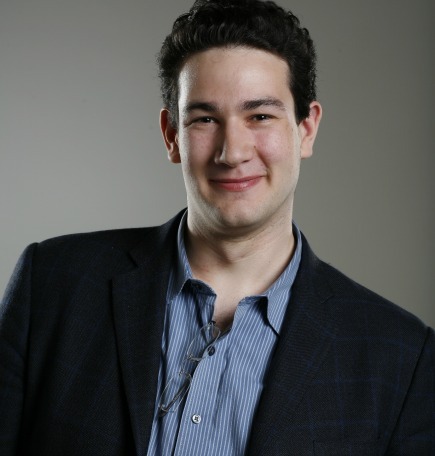 Who is David Burstein (age 24) and what impact do you hope to have with your work as a filmmaker, activist, and author? As a 16-year-old ordinary high school student, watching the election results come in on election night 2004, I was frustrated that more young people hadn’t turned out to vote. I turned that frustration into action. After starting an international film festival for high school students my sophomore year in high school, I knew the power of film to make an impact on my generation. Without any experience making films, and without having to pass any test or be accepted into any circles, at age 16, I set out for Washington to make a film about the youth vote and its importance in the 2008 election. Before long I found myself face to face with a veritable cast of who’s who of American politics and policy including senators Barbara Boxer, Robert Byrd, Chris Dodd, John Kerry, Joe Lieberman, and John McCain, Representative John Lewis, Governor Jeb Bush, Newark mayor Cory Booker, strategist James Carville, General Wesley Clark, and actor Richard Dreyfuss, as well as many young people from communities all over America. The film premiered to great success and led to the creation of Generation18, a youth voter engagement organization that hosted over 1,000 film screenings and registered more 25,000 new voters in the lead up to the election. I did all of this while maintaining a fulltime status as a college student, including a 35 state tour I undertook in the fall of 2008. In the Fall of 2012 we created another film called Up to Us, which we shot and completed in just a month and a half. That film focuses on the optimism and resilience of this generation in the face of the economic crisis and their continued desire to vote and participate in public service. That film is currently finishing a nationwide college campus tour. One of the things I love about being a Millennial is that I feel no pressure to have a traditional career. I’m an activist and an advocate and an author, but I’m also a freelance journalist, writing for Fast Company about everything from new tech companies to entertainment, interviewing everyone from Danny Meyer to Nicholas Kristof and from the creator of Breaking Bad to the creator of Boardwalk Empire. I also regularly do speaking events and consult with businesses and brands on understanding Millennials. Some of these assignments are typical, others are quite the opposite. One assignment from two philanthropists allowed me to help create and run the Bluhm/Helfand Social Innovation Fellowship @ Chicago Ideas Week, which provides grants and other support to young social entrepreneurs in order to help grow their impact. I’ve navigating working on all these different projects while in school and out of school and I love the diversity of my experiences. You could say it’s quite millennial of me. The ability for ordinary people to do extraordinary things is one of the things that I write about in the book and is truly one of the most compelling new trends the Millennials are exemplifying. I’m one example of that. I wanted to write this book because our generation’s story deserves to be told in our own words. There’s never been a more exciting time to be young and I’m so thrilled to be part of this generation. It’s also never been a better time to tell stories and share ideas. The platforms and mediums for storytelling and idea-sharing are more diverse and more plentiful than ever. In the debate about all the aspects of our future, from our fiscal health to the future of capitalism, Millennials deserve to have a prime seat at the table. This is the fast future, but it’s our future.